Cake Batter Blondies – a Celebration! 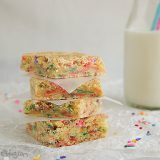 Perfect for any celebration, these sprinkle filled blondies are not only tasty, but only take minutes to throw together! I can’t believe it. 5 years ago today, I pushed publish on my very first blog post on this blog. I definitely wasn’t the first food blogger back then, but wow – I can’t believe how much food blogging has grown since then. If you would have told me 5 years ago where this blog would take me, I probably would have laughed. It’s been a wild ride, but boy – has it been fun!! I’ve been thinking about this day a lot lately. What to write. What to say. About how much this little corner of the internet that I call my own has changed me, and how much it means to me. Today, I am feeling so grateful that I get to do this every day. That this is my job. And how grateful I am for all of you. I do this because I love to share. And I love that you are all here to listen. Your emails, your comments, you visits, your pins – they all mean so much to me. Thank you, thank you, thank you. I really do wish I could give each and every one of you a hug. Because you really do mean the world to me. Today is a day to celebrate. And of course, since this is a food blog and all, we are celebrating with food! Since I am on a major streak of horrible cakes, I decided to do the exact opposite and go completely simple. It’s my blog birthday, afterall, and I’d rather be celebrating with you all than spending hours in the kitchen. And it doesn’t get much more simple than this recipe. Or addictive. 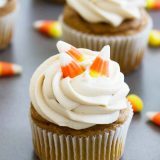 Make sure you have someone to celebrate with when you make these – otherwise, you may find yourself snagging “just one more piece” every time you walk by the kitchen!! Preheat the oven to 350F. Spray an 8×8 inch baking dish with cooking spray. Place the batter into the prepared dish. (Press down with your hands if needed to even out.) Bake in the preheated oven for 25-30 minutes. Let cool for 20 minutes, then slice and serve. How fun! Thanks for the chance! I love your blog (and those blondies look excellent as well!). Happy birthday. THe blondies look great. I am a sucker for cake batter. Oowww. Cake batter rocks…and sprinkles make the world a better place! Happy Blogiversary, Deborah. Taste and Tell is absolutely one of my favorites:-). These blondies are a great example of why it’s a favorite:-). I am following you on Pinterest, too. i am going to make these blondies as soon as i get home. they look so good. Congrats on your blogiversary – 5 years is impressive!! Love your blog 🙂 A fav cookbook of mine is The Best of Cooking Light. This is awesome Deborah. First – congrats on 5 years. That is so awesome, you are truly an inspiration! Second, these blondies are right up my alley. I would eat the whole batch with no issue! Great giveaway…my favorite cookbook is Momofuku Milk Bar cookbook that we have been baking through. It’s challenging but produces great results each time with unique recipes and ingredients. Its’ by-far my favorite! Congratulations! I discovered your blog a few months ago and have really enjoyed it! My favorite cookbooks, Ina Gartin-Barefoot Contessa. This is so awesome! I like the America’s Test Kitchen books. I hope I win! Happy 5 years! I’ve been reading along for many of those and have made lots of your delicious recipes! Thanks for inspiring me in the kitchen. There are some awesome cookbooks up for grabs! And I don’t own any of them! I loooove the Pioneer Woman’s first cookbook. I use it all the time! Congratulations on 5 years! Great blog! Congrats on 5 years! I love your blog and follow you on pinterest. We pin alot of the same dishes. Congratulations on 5 years! I love your blog and have been following for the past year or so shortly after I started blogging. Congratulations on 5 years, Deborah! An amazing accomplishment and a beautiful blog! Ooooh, what a fantastic collection of cookbooks! Congrats on FIVE years! That’s awesome! I now also follow you on twitter. Congratulations/happy birthday!! I love all of the cookbooks, especially Pioneer Woman and Joy! I now follow you on pinterest – great boards! Aaaaand I follow you on pinterest! Congrats again! Congratulations! I’m so glad I “met” you all those years ago. My how our lives are changed! I wish you continued success – you deserve it! I wish I could say I ‘ve been reading this blog all 5 years, but I only recently discovered it through Pinterest. But what a great discovery it’s been! Congrats on 5 years!! What a great giveaway! These are all cookbooks in my saved cart on Amazon! I’d love love love to win! And what great recipes and fabulous photos! I swear that every one of your photos makes me hungry. A big congratulations on five years of blogging!! I have tried a couple of your recipes with great sucess of course I have a lot more printed too try…in fact too many..my bad!! Really enjoy the blogger spotlight and peeking in others kitchens. Here’s to another five!! It’s supposed to be an amazing weekend. Wohoo. Currently my favorite cookbooks are the small-batch baking books by Debbie Maugans ! i love your blog. everything looks so yummy. I already follow via RSS. We are getting snow this weekend! UGH!!!!!!!!! 5 years and growing strong and stronger..congrats Deb! Glad to have known this lovely space with all the scrumptious spreads. 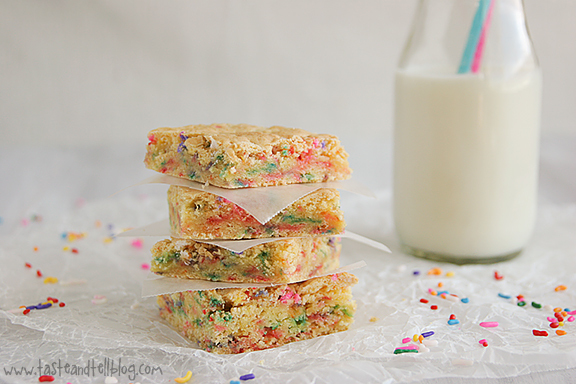 The cake blondies with the colorful specks …perfect treat to celebrate such a wonderful feat. Hugs. Happy anniversary!!! 🙂 love your blog! 5 years! Awesome! What a wonderful giveaway, one of your readers will be very happy! I follow on Facebook and love you! Congratulations and thank you so much for all the wonderful recipes and goodness you share with us all! You’ve made my life SO much easier; every time I need a little special treat to share, you are the first person I come to for a recipe. 🙂 Many more years of blogging and new followers! Happy Blogiversary! 😀 How exciting! Those blondies look incredible. Anything cake batter…hand it over. Haha! And what a great giveaway!!! My favorite cookbook is Barefoot Contessa family cookbook. I’m now following on twitter and I am surprised it took me this long. I’m following on facebook and love to see you posts. I am now following you on Pinterest. I am looking forward to checking out your pins. What a great giveaway – and those blondies look great! Congrats and can’t wait to try the blondies! Congratulations on this amazing milestone!! Five years is a long time to be blogging! Following on facebook for a while now! Those look delicious, unlike the weather outside. It’s been raining off and on for a week now. I want it to get back to the warm and sunny weather we had just a few weeks ago. I’ve liked your page on Facebook. I cannot believe food blogging either and what a gift it has been on so many levels. Congrats on 5 years!!!!!!! Ive only been at it 3, but it’s been lifechanging and I love it! I love Ree Drummond’s first cookbook and would LOVE to win her second. I will definitely try the blondies you have posted. They look easy and yummy. I follow you on facebook and pinterest. Awesome prizes! I get the emails. Can’t wait to try the bondies! The blondies look fantastic. 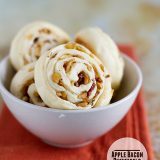 I love baking and will try those! Congratulations on 5 Years! I love cookbooks in general; however, I love the Pastry Queen cookbooks. It is nice and warm down here, almost 82 degrees today!! Thanks for the opportunity. I look forward to your daily posts! Weather….87 and sunny! Congratulations and thanks for the great blog. What a fabulous giveaway! I’m a little afraid to try the blondes… At 9.5 months preggo I think I would definitely eat the whole pan! Congratulations for your continued efforts to touch lives and tastebuds with your blog! 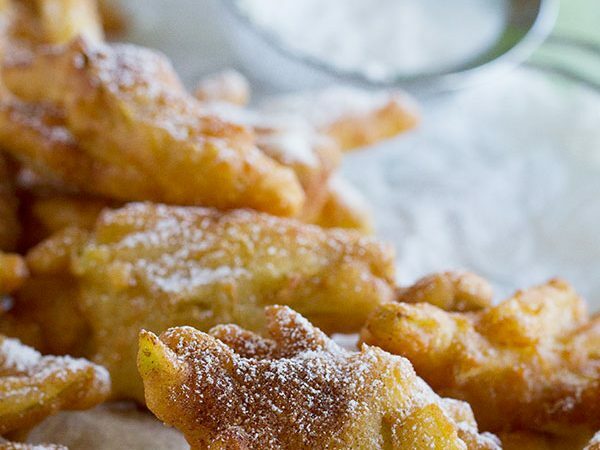 There is a “little” girl who will be absolutely thrilled with this recipe… thank you! I also get updates via email. Thanks again for the amazing giveaway! I love your recipes, have tried a few and am waiting for my next family visit weekend to try several more. I am forwarding today”s recipe to a grand daughter because she loves sprinkles. I love the “America’s Test Kitchen ” Cookbooks”! I love The Pioneer Woman!!! Congrats on 5 years, that’s amazing. I have The Poineer Woman’s first cookbook and have made a number of the recipes. They are all great. Congrats!! I will be making these today!! They look so good!! I get updates via e-mail. Right now I am enjoying church ladies cookbooks! These look fantastic! Congratulations on 5 years! Congratulations on five years of wonderful blogging! I remember when I found your blog, long before I ever met you in person. One of my favorite cookbooks is Baking Illustrated – great recipes and good information about baking techniques. I follow Taste and Tell on Pinterest. Happy Birthday! Love reading this! So happy I found you on Pinterest! Excited to have you on my Facebook likes! Following you on Pinterest too! Added you to my email as well. Thanks so much! Congratulations on reaching the 5 year mark!! The blondies look great – can’t wait to make them. My current favorite cook book is Rachael Ray’s 365. Now I follow on Pinterest, too. Happy 5 year anniversary!!! That is such a wonderful accomplishment and you should be so proud of yourself! I love your blog!!!! And what a fun giveaway- I’ve been drooling over several of those books for awhile! I get email updates from Taste and Tell. The weather here is gray and rainy! I follow taste and tell on FB! I follow taste and tell on pintrest! Congrats on 5 years!!! What an exciting milestone. I haven’t been a reader here for very long, I admit, but I’m already a huge fan of this lovely space you have here. 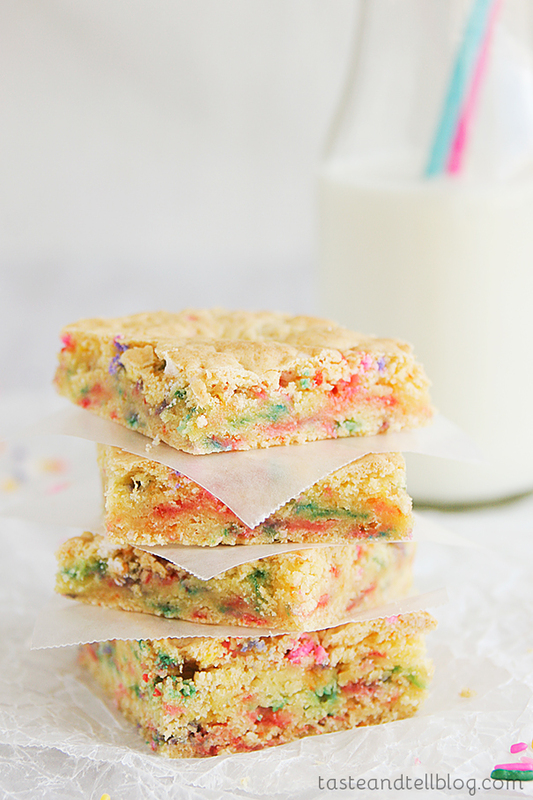 Oh and these cake batter blondies? They look amazing! I can’t wait to make these cake batter blondies, I love cake batter everything! Thank you for sharing!! I followed you on Pinterest! Happy Anniversary! I followed you on twitter….. I look forward to more delicious recipes! Oh wow! 5 years, what an awesome present, and giving it away! 5 years is an impressive feat–bravo! My favorite cookbook is one put out years ago. A regional cookbook called The Three Rivers Cookbook from Pittsburgh. Would love to win, so I can add to my growing cookbook collection! Happy Birthday, I love your blog. I love cookbooks with all my heart too! I signed up to receive email. I like T&T on FB! Congratulations on 5 years of blogging, Deborah! Congratulations are in order on celebrating 5 Years of sharing with us your readers! A super blogsite! I follow you on Facebook & Pinterest. Best of luck for the future. I am going to make the blondies for Easter. They are so festive! I follow you on Pinterest and I am really hoping I win!! 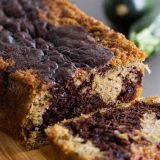 I’ve have tried a few of your recipes, and have a few more I want to try. Cake batter anything sounds amazing! Happy Anniversary! Your blog is truly an inspiration! Cheers to many more great years ahead! 🙂 These cake batter blondies are definitely going on my list to try. I have a weak spot for anything cake batter. I recently made your General Tso’s Chicken and it was soooo yummy!! I have made the cake mix blondies myself. Mine are similar to yours, but I think I like the added white chocolate chips better. Thanks for the recipe! Congrats on 5 years Deborah! I am so happy I stumbled upon your blog several years ago because I have enjoyed following you along on your adventures in and out of the kitchen! Here’s to many more years! These look super good and would be a great twist on a birthday treat!! My favorite cookbooks are Southern Living Cookbooks. Congratulations on 5 years!!! Thanks for the opportunity! My favorite cookbook is the Betty Crocker Cookbook that was given to me from my grandparents (who are now deceased). I will treasure it forever. Thanks for the chance to enter. Congrats on 5 years! I love this blog 🙂 Also, all great cookbooks – I would love to win! New to your blog – can’t imagine why it took me so long to find you, but really glad I did. Congrats on your blogday. Here’s to another 100. Congrats and happy b-day!! So happy I found your blog! you know you were one of the first blogs i was drawn to when i started blogging some 4 years ago. i thought, how fabulous it is to find other people who are foodies and love to mix the salty with the sweet. here on cape cod, there are not many restaurants nor foodies, so i found my love via the food blogging world. here’s to another fabulous 5 years Deb! hell i’d follow you home too…..
Congratulations, Deb!!! Here’s to another 5 years!!! Happy blog birthday! I have Pioneer Woman’s first cookbook and LOVE it! Awesome, I love Joy the Baker!! Just finishing spring cleaning on Saturday afternoon and entering this cookbook giveaway has definately boosted my energy! Wow, congratulations on 5 years and what a fantastic giveaway! It is so inspiring to see so many bloggers with their very own cookbooks! Thank you! Unless I’m the winner…I’m already jealous of whoever wins this too! Great cookbooks!! I’ve liked Taste and Tell on Facebook!! I’m following your great boards on Pinterest! 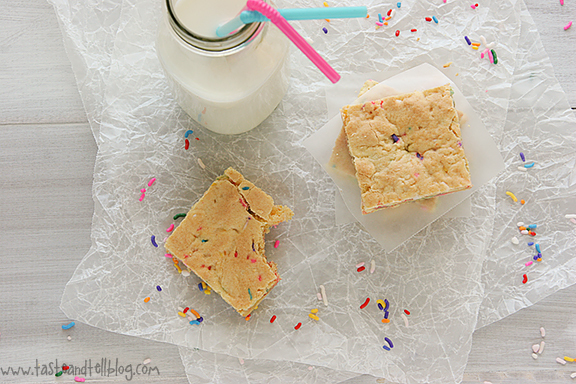 Cake Batter Blondies look like a blast! Cannot wait to try out your recipes! My kids would love the cake batter blondies! My favorite cookbook, so far, is the Tartine Bakery cookbook because though the recipes are a challenge, the results are delicious!! i have so many cookbooks, it’s hard to say which is my favorite! I subscribe to your blog and enjoy your posts! I have 2 family cookbooks that I love! I love seeing who submitted the recipe (aunts and cousins) and trying things I know they loved. I’m folllowing you on Pinterest! Love the blog, congrats on 5 years! I love Pioneer Woman’s last cookbook and am excited to take a look at her new one. Thanks for the great giveaways! I follow Taste and Tell on Facebook. Thanks! Awesome giveaway, thanks! A few of my favorite cookbooks are some of the classics: Moosewood Cookbook, Fannie Farmer, Great Good Food, and Better Homes and Gardens. Saw The Pioneer Woman’s second cookbook at costco the other day. How exciting it’s out with great new recipes! What a great giveaway. One can never have too many cookbooks! Congrats on 5 years! Love your recipes! I don’t have a favorite cookbook because I find so many recipes online I want to try that sometimes I don’t even think of looking through my cookbooks. Happy birthday to you! What a fun giveaway 🙂 Your red velvet cheeseball was amazing! And I also follow you on Pinterest! Thanks again for a great recipe! Love recommending your blog after my successful endeavors in the kitchen! Made easy yesterday for a birthday treat for my brother – him and his college roommates are sure to enjoy and my daughters had a blast making them! Congratulations! These books all look awesome! Isn’t it so amazing how much blogging can change you and your life? And kind of be the best thing ever? I’m SO glad we “met” through blogging…your posts are always a bright spot in my day! Happy bloggiversary love! I love your blog! I have tried a few of your recipes. 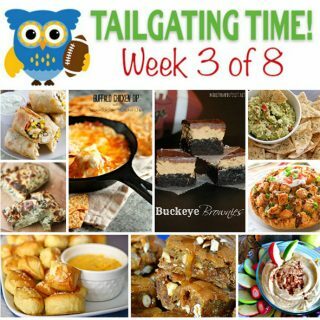 I think the versatility, blogger spotlights, ideas for dinner, and the awesome desserts are all fantastic! Thanks for a great blog! I just added your blog to my reader! I just “liked” you on facebook. 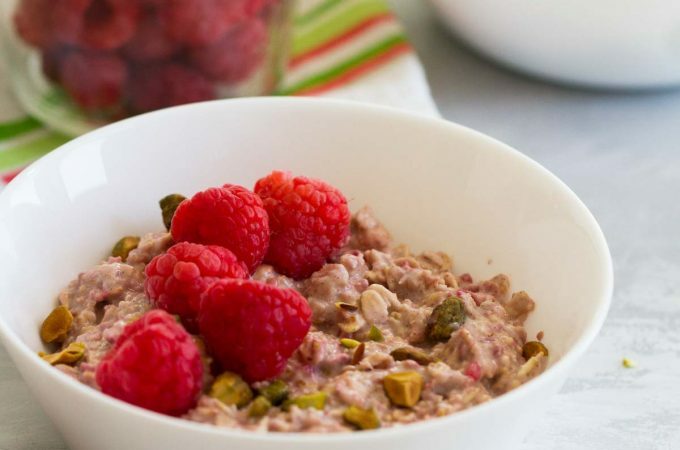 And last, but not least, I’m following you on Pinterest (where I found this delicious looking recipe!). I’ve just recently gotten into cookbooks. I LOVED the Pioneer Woman’s first one, and I just purchased two Dorie Greenspan cook books on Amazon for $5.87. I was very excited about that! Wow. These look incredible. Everyone in my office LOVES funfetti and I have definitely caught the bug. I may have to convince someone to make these for my birthday this month! Happy Anniversary! love the blog!! can’t wait to see what you’ll come up with next! Just started following your blog through reader. Keep it up, girl! …and started following you on Pinterest. This is an awesome giveaway! I’m excited for whoever wins. I’m now following you on twitter! I’m a fan of yours and PW. Too many good recipes on each to narrow it down to JUST 1. Happy Birthday! 5 years is a great accomplishment. I love your blog! Happy 5 years! Cant wait to try the recipe! Wow! Congrats for 5 years! These blondies look amazing, and easy! Love the fact that they’re made in an 8×8. Congrats on 5 years! It is cold here today despite being spring 🙁 But I can’t wait to try these!! And lastly I follow all of your pinning boards on pinterest. Thank you so much for this opportunity! Great recipe! I love cake-flavored things, especially ones with sprinkles. Following via twitter.. hoping for that Joy the Baker cookbook! The cake batter blondies AND the cookbooks look fabulous! Thanks for the chance! You were one of the pioneer food blogs for me. I read religiously every day. Im so happy that 5 years later I can call you a friend! Congratulations!! You work hard and it shows. Thank you!!! I just ‘pinned’ these blondies! Yummo! I follow your blog via reader. I now follow you on Facebook as well. This looks fantastic! I cannot wait to try it out this weekend. Happy 5th! Those blondes look heavenly and I’m thinking a perfect spring break backyard bbq treat. 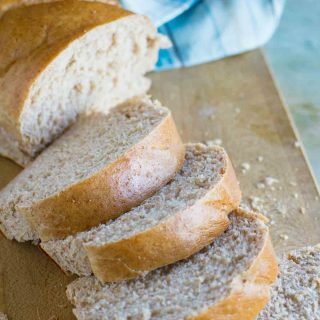 I have an addiction that I suspect we all share, I’m addicting to making and trying new foods so I really enjoy your blog and living in the 21st century where things like this can exist yet I totally love good old-fashioned hand me down type of recipes. We’ve got the best of both worlds! Wow, five years? CONGRATS! 🙂 These blondies look like the perfect way to celebrate. 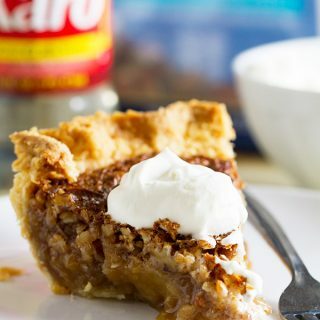 This is a really easy and awesome recipe, and I’d love to try it out. However, I can’t find yellow cake mix anywhere 🙁 I was wondering if it would work with lemon cake mix. And if so, what quantity in grams will be required? 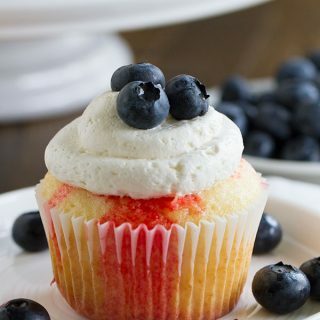 @Sayoni, I’m sure it will work with lemon cake mix, but the taste will be different. I think that a standard cake mix here is 15.25 oz, so you would just need to convert that into grams, I believe.